You’ve probably received a host of New Year/new you/new business emails since Big Ben temporarily broke his silence to ring in 2019. My last intention is to add to the pressure. If making resolutions or New Year goal setting isn’t for you, I completely understand but if you are someone who likes to start the New Year with a plan, I thought you might enjoy my tips for setting business goals that you’ll actually stick to over the next 12 months! My advice is to make your goals tangible and measurable whenever possible. Business and personal goals often fail because people are too vague about what they want to achieve or the goals are simply too big to be tackled as a single objective. Failure often happens because people simply don’t know where to start. For example, how do you measure whether you’re succeeding at a goal like, “I need to get better with money”? The outcomes would be too subjective. It isn’t even enough to say, “I want to save £1,000 towards a holiday this year” because you don’t have a plan for how. The best form of goal, with this example, would be to say, “I want to set up a standing order to transfer £85 a month for the next 12 months from my earnings to a holiday savings account”. This gives you a clear plan for what you want to achieve, how you’re going to achieve it and when you’ll know it’s done. Instead of “I want to grow my following on social media”, you could say, “I plan to grow my Facebook page by 30 followers a month over the next three months using a mix of organic posts and paid advertising. I plan to spend £20 a month on Facebook ads and post at least once a day – I will spend an hour a week on creating weekly batches of posts (Wednesday 1pm – 2pm)”. Instead of “I want to grow my network”, you could set the goal of, “I will attend six face-to-face networking meetings over the next 12 months and get the contact details for at least one person at each meeting”. You would be even more likely to achieve the goal if you’re able to identify which network meetings you will attend and put them in your diary. Or you could turn “I want to grow my mailing list” into “I will write and publish an ebook about <insert topic> on my website by the end of March and will spend one hour a week (Friday 10am-11am) on this between now and then”. The examples above are what are referred to as SMART goals. As a trainer, you may already be familiar with this concept but how often do you use it? Specific – What do I want to achieve? What does the outcome look like? Measurable – How will I know when it’s done? Attainable – Do I have the resources in place to make this achievable? Relevant – Why am I doing this? Time-orientated – What is the end-date? I want to get quotes by this Friday from three graphic designers about creating the ebook at as PDF with a branded design. I want to promote my ebook with a virtual book tour so I will contact the administrators for ten Facebook pages that might allow me to host a page takeover next week. The key is to break your goals down into small, manageable steps. This will give you frequent moments where you can see what you have achieved within a relatively short timeframe, which is hugely motivational. One other secret to creating goals that stick is to set a date to review them and make sure you’re on track. You might decide to spend an afternoon three months from now checking whether all your goals are still attainable and relevant and to update the schedule for what you need to do. The aim is to keep your goals current, achievable and in your sights at all times. Think of them as a roadmap marking out each junction, each turn, and each potential stop and start. Yes, you need a destination but your goals should be the stages of the journey that help you get there. 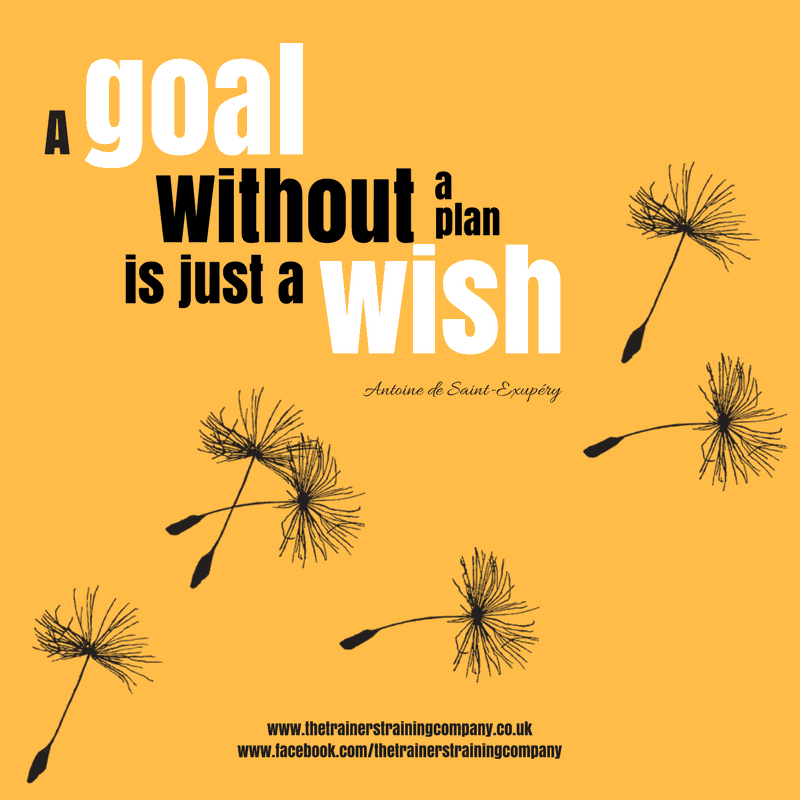 Goal setting is a great way to re-energise and refocus your business. For more tips like this, grab your free copy of my report, 20 ways to re-energise your training business.